This rich and penetrating conditioner strengthens hair. It contains organic shea butter which is rich in vitamin A and E. Intensely repairs and helps in retaining elasticity of the hair. Organic passion flower is added for its relaxing and balancing properties; Organic goji berry delivers high antioxidant properties. 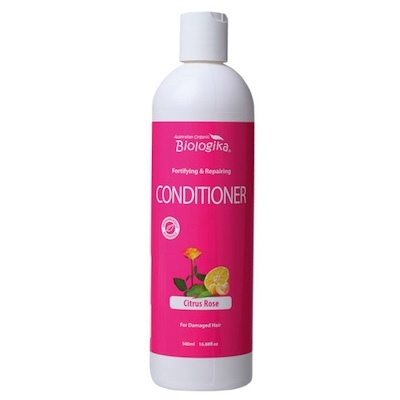 The combination of these precious butters and extracts in this conditioner will instantly penetrate, gently moisturising and leaving your hair and scalp smooth and replenished. Ingredients: Purified water, organic aloe vera juice, natural cetyl and cetearyl alcohol, organic shea butter, organic extracts of goji berry and passion flower, locust bean gum, organic jojoba oil, wheatgerm oil, glyceryloleate, rose geranium pure essential oil, organic mandarin red oil, natural vitamin E (tocopherol), pro-vitamin B5 (D-panthenol), citrus seed extract, olive leaf extract, potassium sorbate and citric acid.